The PBL (Planetary Boundary Layer) is the lowest part of the troposphere and plays an important role in our everyday live. Diverse applications of boundary-layer meteorology require better understandings of the PBL. The depth of the PBL varies greatly in space and time, but knowledge of the depth of PBL aid in the validation of parameterizations of the PBL in general circulation models and improve our abilities to model the coupling between the atmosphere and the Earth's surface. 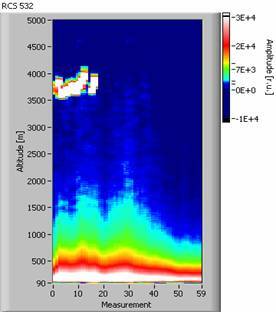 The PBL depth is most easily calculated by looking at a thermodynamic sounding, but there are many other new methods for doing this. Two methods have been used in this work to show that LIDAR provides accurate measurements of the top of the boundary layer: (i) thermodynamic sounding; (ii) the bulk-Richardson number and Richardson number. In addition, the measurements were discussed in synoptic context, using maps and air mass back-trajectories. Similar results for the PBL height obtained by LIDAR data and the other two methods carried out in this paper, demonstrates the importance of the remote sensing measurements in atmosphere. The Planetary Boundary Layer (PBL), has an important role for the whole atmosphere-earth system because it acts as the interface where the coupling between the atmosphere and the Earth's surface occurs, and the depth of the PBL controls the transfer of momentum, heat and moisture between them. The planetary boundary layer (PBL) contains most of the aerosol and water vapor in the atmosphere and thus has a major influence on radiative fluxes. Studies of climate sensitivity, therefore, require careful consideration of the role of the PBL. Environmental applications also include long-term air-quality and climate modeling, air chemistry, and meteorological forecast modeling. The top of the PBL has been given many names; the most popular being inversion height, mixing height and mixed-layer depth. The commonality exists in that they all refer to the greatest depth to which atmospheric constituents are well mixed. The PBL is usually within a 1000 meters of the surface. Strawbridge, K. B. and B. J. Snyden  shown that lidar has been shown for many years to provide accurate measurements of the top of the boundary layer. Aside from being clearly visible on lidar plots, determining the PBL height from lidar data does not require the more difficult task of obtaining an absolute calibration of the system. Several methods have been employed to extract the PBL height from lidar data. These include critical threshold techniques, gradient techniques, wavelet analyses and techniques using idealized profiles. The fundamental premise takes advantage of the large gradient in aerosol concentration generally evident between the boundary layer aerosols and those found in the free troposphere. There are many different ways of acknowledging and accounting for the PBL. The height of the PBL is calculated using the bulk-Richardson number (Troen and Mahrt, 1986) and Richardson number. The bulk-Richardson number is the ratio of convective available potential energy (CAPE) to the magnitude of low-level shear; it measures the intensity of turbulence and it is used close to the ground. The Richardson number is a non-dimensional ratio of gradients, the most widely used to indicate the presence of turbulence, using it to determine the stability of a level of the atmosphere. The Richardson number is similar to the bulk-Richardson number and is the ratio of buoyant suppression of turbulence to the shear generation of turbulence. Radiosoundings are the most common data source to retrieve the Atmospheric Boundary Layer (ABL) height, based on wind, temperature and pressure profiles but, in Bucharest regular launches are made only twice a day at synoptic time: 00 and 12 UTC. The lidar signal shows a strong backscattering within the ABL, decreasing through a transition zone and becomes weak in the free troposphere. This behavior is the base for the lidar estimation of the ABL height. Usually, the transition zone can be assumed to be proxy for the temperature inversion (Brooks, 2003). But interpreting data from lidar must take account on the advection of air mass which can change the vertical mixing. Consequently, we determined the PBL height by using lidar profiles obtained with lidar system presented in Section 2.In Section 3 we have compared the lidar profiles with the radiosoundings and Richardson numbers. The analysis of air mass backtrajectories and, synoptic maps confirmed the advection of Saharan dust over Romania in the day under observation with lidar system. The results are discussed in Section 4. The lidar system named LISA (LIght Scattering Aerosol) is based on a Nd:YAG laser working at the 1064 nm fundamental wavelength and at 532 nm second harmonic delivering pulse with high repetition rate. The system can detect micron size aerosols from far distances, with a very god spatial resolution. It is used for lower troposphere studies, including the planetary boundary layer. The lidar measurements were made at ROMEXPO, northwestern part of Bucharest (44.25 N, 26.05 E) for a short period: April 04-06, 2006. Sequences of 1-minute duration were recorded, (Fig.1and Fig.2). Active remote sensing systems such as lidar use aerosols as tracers of the Atmospheric Boundary Layer dynamics. The lidar signal shows a strong backscattering within the mixed layer synonym with planetary boundary layer. It decreases through a transition zone between atmospheric boundary layer and the free atmosphere. This zone is often named Entrainment Zone (Stull,1988). Fig. 3: Range Corrected Signal (a.u.) – temporal evolution - on April 5th 16:00 UTC, 532 nm sounding wavelength. Strawbridge, K. B. and B. J. Snyden (2004) shown that lidar has been shown for many years to provide accurate measurements of the top of the boundary layer. Aside from being clearly visible on lidar plots, determining the PBL height from lidar data does not involve the more difficult task of obtaining an absolute calibration of the system. Several methods have been employed to extract the PBL height from lidar data. These include critical threshold techniques, gradient techniques, wavelet analyses and techniques using idealized profiles. The fundamental premise takes advantage of the large gradient in aerosol concentration generally evident between the boundary layer aerosols and those found in the free troposphere. Fig. 1 Backscattering coefficient on April 5th, 532 nm sounding wavelength – dust intrusion at 3000 – 5000 m penetrating from the free troposphere (14:00 UTC) in the PBL (17:00 UTC). The top of the PBL is often marked with a temperature inversion, a change in air mass, a hydro-lapse, and change in wind speed and/or a change in wind direction. The PBL is most definable in situations where differential advection is occurring or when a shallow front is at the surface. At the top of a front, there is an abrupt change in air mass. In some cases the transition between the PBL and free atmosphere is not well defined. However, a general height of the PBL can be determined by looking for subtle changes in dew point (or equivalent potential temperature) and wind speed/direction. Inversions traps air within the PBL and do not allow convection to occur into the middle and upper atmosphere. 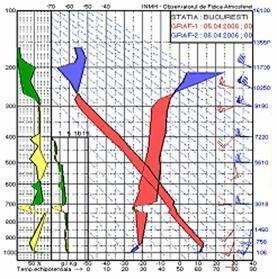 Change in air mass and the temperature inversion can be observed on the available radio-soundings performed by National Meteorological Service at 00 hour (Fig.2) for the days 5-6 in April 2006. From atmospheric state curves one can observe the equivalent potential temperature inversion, at 1300m, and a warm air mass advection in 24 hours. This means the upper limit of the atmospheric boundary layer in these days is closed to 1300m. The air circulation is southwest and the humidity is very small, under 30 percents. These prove the Saharan dust intrusion observed on LIDAR imagines.????!!!! The radio-sounding data were also used to calculate the Richardson numbers. Fig.2. The radiosounding on April 05-06 2006, 00 UTC. Interpreting data from LIDAR it is necessary to taking into account that meteorology and consequently origin of air mass influenced the state of the atmosphere and the height of local ABL. The type of air circulation and the change of air mass can be observed in synoptic and absolute and relative geopotential maps (Fig.3). 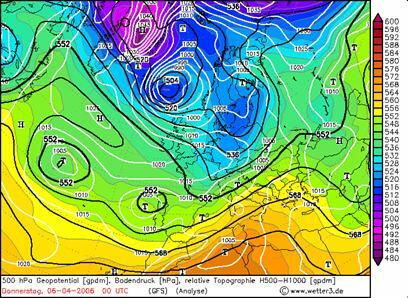 The warm air mass advection is better observed in figure 4, the map for 850 hPa level. Fig.3. MSL (mean sea level pressure) 500hPa geopotential height, and H500-H1000gpdm, relative geopotential at 00 UTC on 06.04.2006. Fig.4. 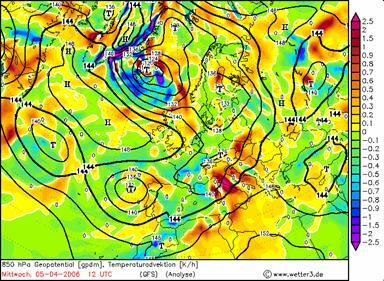 850hPa (~1500m) geopotential height, and 1200 UTC on 5.04.2006. One can observe the warm air advection. In addition, to emphasize the change in air mass and consequently the intrusion of Saharan dust, kinematics backward trajectories have been invoked. The version 4 of the Hybrid Single –Particle Lagrangian Integrated Trajectory model (HYSPLIT), developed by the National Oceanic and Atmospheric Administration (NOAA)’s Air Resources Laboratory (ARL) (Draxler and Hess, 1998; Draxler and Rolph, 2003; Rolph, 2003) was used. The backward trajectories are shown in Fig. 5a,b and can be observed the change in trajectory at altitude on April 05 2006.??? These maps clearly identifies the Saharan origin of the upper air-masses. Saharan dust layers reach the southern part of Romania predominantly by cyclonic circulation due to the strong trough observed at all the levels from a cyclonic system located in northwestern part of Africa. trebuie refacute! Nu apar traictoriile pentru nivele! Fig.5 6-day backtrajectories arriving at 300 and 839m at 00 UTC. where g is the acceleration due to gravity, z0 the height of the surface, the potential temperature and u and v the zonal and meridional wind components. The height of mixed layer (ML) is defined as the height where the bulk-Richardson number becomes equal or larger than the so-called critical bulk-Richardson number, which has a value of 0.21(Vogelezang and Holtslag, 1996; Menut et al., 1999). Beyond this critical value the atmosphere can be considered fully decoupled from the mixed layer, ML (the PBL height).The calculated value from radio-sounding data was 0.54, for April 5th 2006. Therefore we can say that the value of PBL height determined from LIDAR backscattering coefficient and RCS imagine is good. The Richardson number is a non-dimensional ratio of gradients, the most widely used to indicate the presence of turbulence, using it to determine the stability of the atmosphere. The Richardson number is similar to the bulk-Richardson number and it is the ratio of buoyant suppression of turbulence to the shear generation of turbulence. Values less than 0.25 are considered unstable (Glickman, 2000). Since the PBL is on average less stable than the free atmosphere, the height of the PBL is determined by noting the point where the Richardson number changes significantly. where V is horizontal component of the wind vector, . The Richardson number dependence of altitude is shown in Fig.6. Closely to1400 m the Richardson number changes its value. The differences between the values of the PBL height determined from LIDAR data and radio-soundings ( temperature inversion method) can be explained by the fact that the lidar -derived transition zone does not respond directly to the thermodynamic properties of the atmosphere. 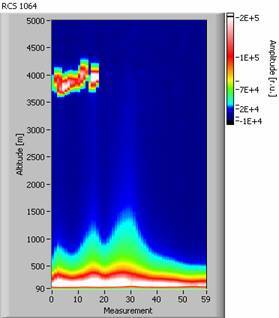 In this case the height of the detected layer is the results of the advection of air mass and not to vertical mixing. Layer was formed when aerosol was injected by air mass from northern part of Africa (Saharan dust). Mai completez dupa ce lamurim metoda cu lidarul. 1.Glickman, Todd ed. Glossary of Meteorology. American Meteorological Society: Boston, Massachusetts, 2000. 2.Stefan S., 1998: Air Sea Interaction. Ed.Univ.of Bucharest, 250pg. 4.Stull, Roland B. 1988. An Introduction to Boundary Layer Meteorology, Kluwer Academic, 666pg. 5.Troen, I. and L. Mahrt, 1986. 'A Simple Model of the Atmospheric Boundary Layer: Sensitivity to Surface Evaporation.' Boundary Layer Meteorology. Vol. 37, pp. 129-148.